DURHAM, N.C. — No. 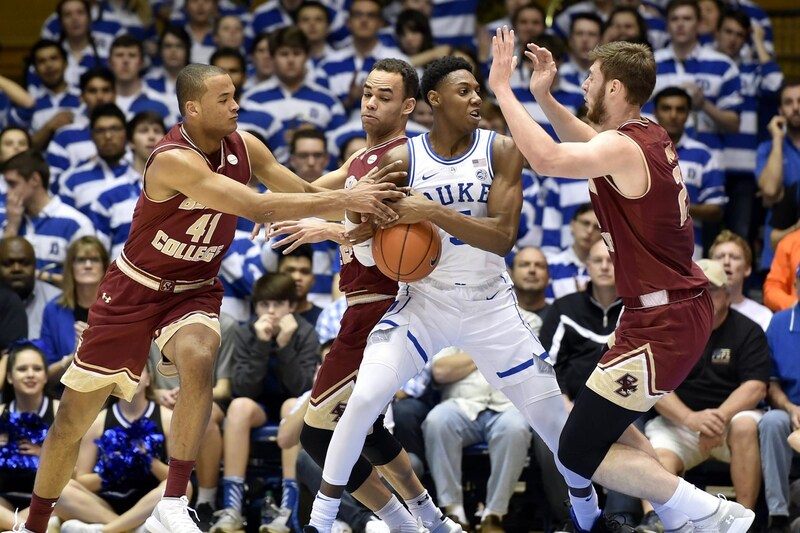 2 Duke opened the second half on an 8-0 run as the Blue Devils captured an 80-55 victory over Boston College Tuesday evening at Cameron Indoor Stadium. Boston College carried a 30-28 lead into halftime after limiting Duke to 1-of-15 shooting from three-point range in the first half. Duke outscored the Eagles 52-25 over the final 20 minutes of play to secure the victory. The Blue Devils moved to 20-2 overall and 8-1 in the ACC while Boston College dropped to 11-10 on the season and 2-7 in conference play. BC shot the ball well from downtown in the first half to take the lead into the half. The Eagles connected on four of nine from behind the arc in the first 20 minutes. Nik Popovic led the way with eight in the first half while Ky Bowman scored all seven of his points over the final five minutes of the half. Duke used the early second-half run to regain the lead and never looked back. Freshman Cam Reddish led the Blue Devils 24 points while fellow freshman Zion Williamson contributed 16 points and 17 rebounds. Jordan Chatman led BC with 16 points while Popovic contributed 13 points and eight rebounds. Bowman added 11 points and six rebounds as well for the Eagles. Jordan Chatman led BC with 16 points, knocking down 4-of-9 shots from the floor and 6-of-7 from the charity stripe. Nik Popovic had 13 points and a team-high eight rebounds. Ky Bowman extended his ACC-best double-digit scoring streak to 30 games, coming up with 11 points on the night. He added six rebounds and six assists. Steffon Mitchell recorded four points, six boards, two assists, and a steal. The Eagles shot 35.7% from the floor, while Duke connected on 44.6% on the night. BC made 9-of-11 from the charity stripe on the night. +17 – Duke totaled nine blocks and nine steals on the night while BC finished with just one steal and zero blocks. Only one BC player – Steffon Mitchell – cracked double-digits in efficiency. The sophomore tallied an 11 on the night. Efficiency rating is calculated using the following formula: (PTS + REB + AST + STL + BLK – Missed Shots – TO).